Explore the beauty of hidden valleys, meadows of wildflowers spread over miles and green lakes in the lap of Might Himalayan mountains. Take yourself to pristine sparkling Lakes in midst of majestic mountains of Kashmir Himalayas, Kashmir Great Lakes Trek is the most popular trek in Kashmir. Kashmir Great Lakes Trek is surprisingly an easy trek, and great for people with little trekking experience. Kashmir Great Lakes Trek is the best way to see the true beauty of Kashmir which lies in the hidden valleys which are not accessible by road. Trek covers seven beautiful Himalayan lakes, which are accessed through alpine pastures of beautiful wildflowers. Day 2: Sonamarg (9000 feet) to Nichnai (11,500 feet). Day 3: Nichnai (11,500 feet) Vishansar Lake (12,000 feet). Day 7: Satsar (12,000ft) to Twin Lakes of Gangabal (11,500 ft). Day 8: Gangabal (11,500 ft) to Naranag (7,450ft). Tour operator can arrange the pick up from TRC Srinagar at additional cost. Drive from Srinagar to Sonmarg, which is 4 hours journey. If you are coming on your own to the campsite, you are expected to report the Sonamarg base camp by 5 pm. It is advisable to arrive in Srinagar a day early as it helps in acclimatization. The trek to Nichnai covers a distance of 9 km. 3 km into the trek, you will spot a Lone dhabha. Pick up your stock of short eats from here. It is a total 3-hour ascent followed by 1-hour descent and finally a gentle 2-hour ascent to Nichnai which is at 11,500 feet. The trail takes you through meadows, dense forests with Maple, Pine and Bhoj trees. You will reach Nichnai in about 6 hours. Camp overnight at Nichnai. The day's trek is a long 12 km walk on meadows with the scenery changing for the better all along. Start by 8 am to give you enough time en route to enjoy the meadows. Your first destination for the day is to cross the Nichnai pass or Vishnusar. It will take you about 6 hours to reach Vishnusar, gaining an altitude of 2000 feet. Pitch your tents next near a water source. Camp for the night. This day can be spent leisurely, exploring the twin lakes. These lakes are full of trouts and trout fishing is popular. Obtain a permit from Srinagar for fishing. The trail from Kishansar climbs up to the top of a ridge and on the top of the ridge is the Gadsar pass. Spend time at the Kishansar meadows photographing the lake from various angles. Camp for the night at Vishnusar. Start trekking towards the top of the ridge from Kishansar. The trek is a steep 2-hour ascent followed by a steep descent followed a gentle walk in the meadows. It will take you from 12,000 feet to the Gadsar pass at 13,750 feet covering a distance of 10km. An hour into the trek, you will see the most beautiful view of the twin lakes together. On the other side of the Gadsar pass stretches a long valley with 2-3 small lakes. You can also see a few peaks outside the LOC (Line of control). Walk through a long stretch of multicoloured flowers, till you reach Gadsar lake. You will reach the campsite in 5 hours. There is an army camp closeby and all details of the trekkers and staff including original id cards are recorded, collected and checked here. Camp for the night at Gadsar. Begin your trek towards Satsar, traversing through meadows, a ridge and a stream. The trek covers a distance of 12 km in 6 hours. Before you reach the first lake, you will have to report to the Satsar army check post. It is the 3rd line of defence from the LOC. The same process of ID checking, collection repeats here too. Ten minutes out of the army camp is the first of the Satsar lakes. The lake is pretty big and looks picturesque in its green setting with mountains in front. Camp here for the night. You will need to cover 9 km today. It may take around 6 hours. The trail is mostly descending, with a steep ascends, bringing you down from 12,000 feet to 11,500 feet. Trek up half an hour out of camp, to reach the biggest Satsar lake. The terrain is bouldery and it is more of a boulder hopping exercise than anything else. Look out for the Gangabal and Nandkol twin lakes – a beautiful view from the top. Descend further down to meadows and to the Nandakol lake, beside which is the Gangabal Lake. Camp for the night at Gangabal. Enjoy the bonfire if the weather allows. The final descent is quite taxing, as it involves a long and steep descent, but it also passes through the most beautiful pine forests. It covers a distance of 11 km and dropping from 11,500 feet to 7,450 feet. The trail descends down a ridge onto a meadow with pretty little yellow flowers and then moves in and out of a pine forest until it hits the main road head of Narang. You will reach Narang in about 6 hours. The trek ends at Naranag. All camping staff - cook, helpers, etc. Qualified and experienced trek leader and support staff. Unscheduled stay due to a landslide. Porters or mules to carry any personal luggage. Permit charges for foreign nationals. Trekkers with premedical conditions should carry sufficient medicines for at least 10 days. Backpack (40-60 litres): Backpack with sturdy straps and supporting frame. Rain cover for the backpack is essential. Daypack (20 litres): It is mandatory to carry a daypack if you choose to offload your backpack. If you decide to carry your backpack, a day pack is not required. Trekking shoes: No sports shoes. The shoes need to have soles with good grip and ankle support. Do not wear a new shoe to a trek. It might cause blisters. Before bringing them to trek, wear it for a week to make it softer. Trek pants (3 pairs including the one you are wearing): We highly endorse synthetic quick-dry pants as they are light. Plus, when it’s cold you can wear one over the other. While trekking a pair is what you would carry apart from the worn. You could keep the third pair for your return journey. Alternative: Cotton pant with many pockets / Track pants are comfortable too. Collared t-shirts (3 pairs including the one you are wearing): Preferably light, full sleeve t-shirts. The collar and the sleeves prevent sunburns on the neck and arms. Avoid loud colours that would distract birds and animals. Full sleeve woollens (2 pairs including the one you are wearing): We endorse fleece over wool as it is lightweight, compact and warm. Raincoat/poncho: A lightweight poncho is preferred as it covers your rucksack as well from the top. A raincoat can also be used as windproof when required. Enquire tour operator for the availability of ponchos at the base camp. Balaclava: The cap must cover your ears and neck. You may also use scarves. Synthetic hand gloves: Ensure that the gloves are waterproof. Suncap: 1 pair of nice warm gloves required, fleece or woollen. 1 pair of waterproof/resistant, windproof gloves. You get very thin inner gloves nowadays. You may get one of those to use layering. Sunglasses: Curved ones will cover your eyes well. No blue coloured sunglass — they don’t block UV. Blacks, greens, browns are fine. Avoid multi-tone sunglasses. Sunglasses prevent snow blindness. Sunglasses are mandatory for this trek. People who wear spectacles, choose one of these – contact lenses, photochromatic glasses. Camera: Carry all accessories – spare batteries, charger, etc. Water bottles: 2 bottles, 1 Litre each. Packaged drinking water bottles. Trekking pole: Trekking poles are mandatory. Duralumin 4-step telescopic anti-shock trekking poles are available with tour operator at the cost of Rs 450. Plastic covers: While packing, use plastic bags to compartmentalize things and carry a few extra plastic bags for wet clothes. 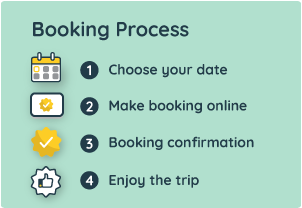 The contact number and other details of the tour operator are shared in the booking voucher, sent to you via email after booking.